Cuchifritos is pleased to present the latest “Kangarok” battle drawing by The Shining Mantis, a Brooklyn-based collaboration consisting of Mike Estabrook and Ernest Concepcion. Engaged in mortal combat this past weekend, the resulting mural will be celebrated this Saturday afternoon from 4-6pm. The gallery will be open Tuesday – Saturday from 12 – 5.30pm. The primary work done by the duo are the legendary battle drawings known simply as “Kangarok,” a fusion of the unnamable presence of the Mephistophelic Kangaroo, and Ragnarok, the Nordic apocalypse. “Our work is about antagonistic collaboration: battle drawings. We fight each other through spontaneous bursts of imagination. 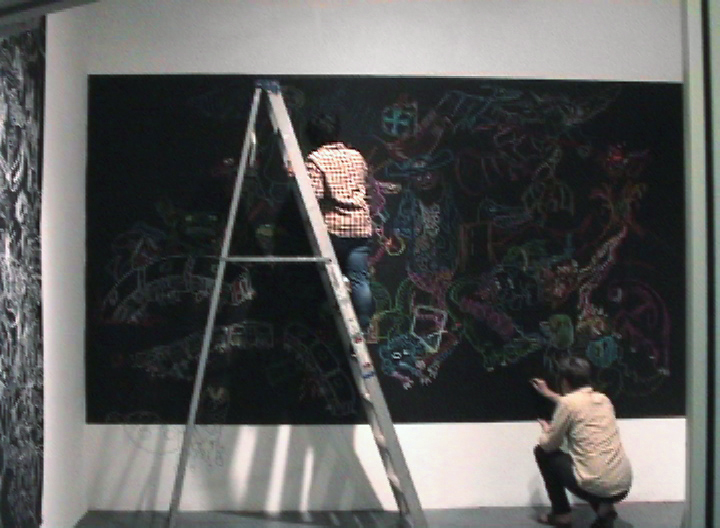 These drawings most often take the form of large-scale chalk drawings, done directly onto the wall. Also on view, are works on paper and a time-lapse video of their debut “Kangarok I” mural for the LMCC benefit Gala in 2007. A 135 foot long chalk drawing on the walls of the 52nd floor of 7 World Trade Center that took 4 days to draw.